Check out the biggest news in Cinnaminson Sports! “Cinnaminson’s Hope Addlesberger battles for the ball during an Oct. 4 game vs. New Egypt. The Lady Pirates won 5–0.” LARRY HENRY JR/The Sun. 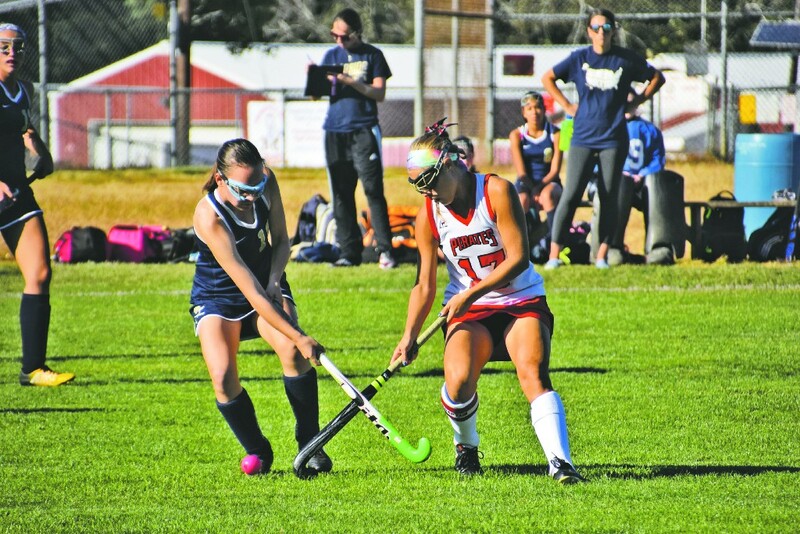 Following a 3–2 loss to Delran on Sept. 27, Cinnaminson field hockey have won back-to-back games. A 4–1 victory over Bordentown on Thursday, Sept. 28 was sparked by a four-goal performance from leading-scorer Maura Tumelty. Grace Burns made six saves in the victory. The Lady Pirates kicked off October in fine form, defeating New Egypt 5–0 on Wednesday, Oct. 4. Five players got on the scoresheet, while defensively Cinnaminson held their opponents to one shot on goal. Cinnaminson (10–1) next travels to face Maple Shade on Friday, Oct. 6 with opening whistle scheduled for 6 p.m.
Cinnaminson girls soccer started the month of October in great fashion, cruising to a pair of wins. The Lady Pirates (8–1–1) rolled past Northern Burlington 6–0 on Monday, Oct. 2. Hailey Gutowski led the way with two goals, while four other players each netted a goal. Cinnaminson extended their current unbeaten run to nine games, defeating Pemberton 3–1 Gutowski, Emma Karch, and Cassidy Updike each scored goals while goalkeeper Maddie Ogden made four saves in the win. The Lady Pirates return home on Friday, Oct. 6 to host Holy Cross at 3:45 p.m.
After suffering back-to-back losses in the middle of the month, Cinnaminson football bounced back with a huge win in Glassboro on Sept. 28. Mario Patrizi’s team smoked Glassboro 34–0,behind outstanding performances by quarterback Shawn Ruffin and running back Rashad Raymond. Ruffin, a rising junior, finished the game with 137 passing yards along with his touchdown passes. Raymond powered his way to 206 yards and two rushing scores. Running back Kevin Schoch totaled 92 total yards and a pair of touchdown catches. Cinnaminson (2–2) returns to action on Friday, Oct. 6 as they travel to Robbinsville High School. Kickoff is slated for 7 p.m.